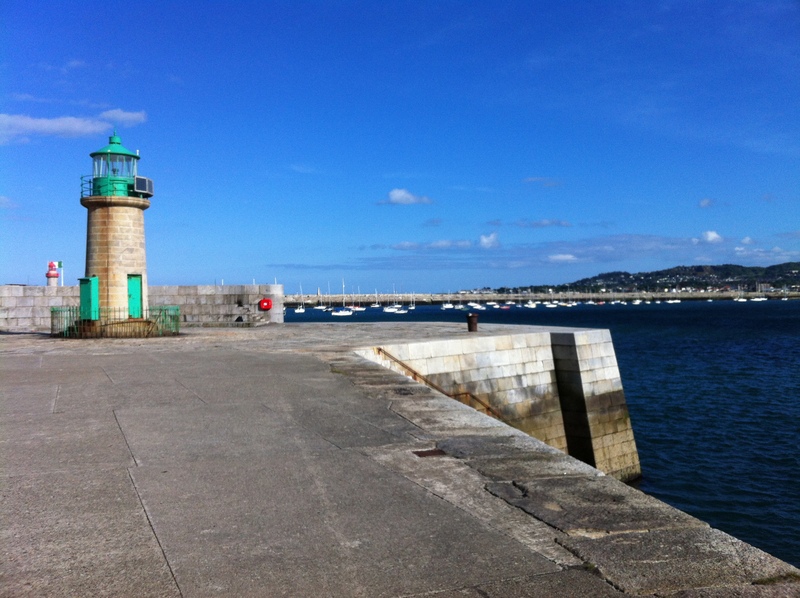 East is East | Dun Laoghaire’s Piers, part deux. 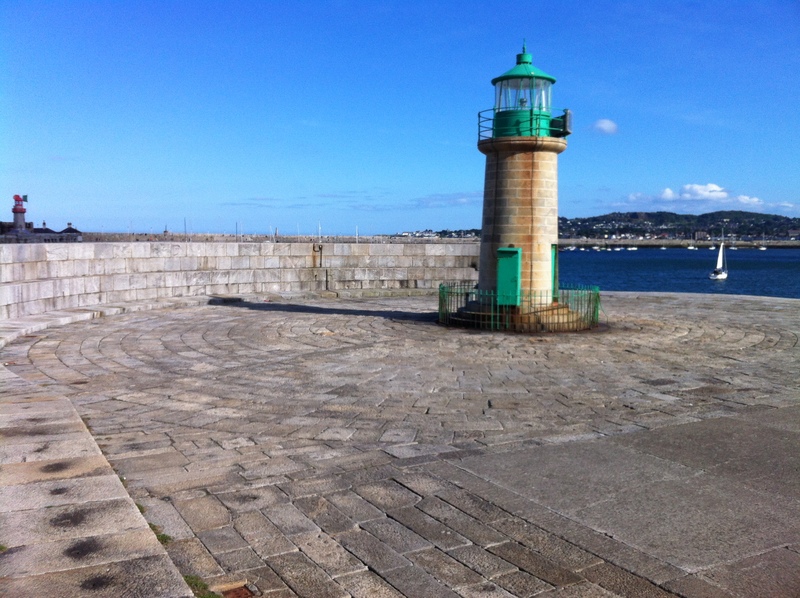 From here we could look across the harbour, to the East Pier, and its Red painted lighthouse, a hundred metres or so away. This looks tempting, no? So today, in the interests of balance as well as temptation, we shall complete the set (brace?) and visit this wildly popular East Pier..
First of course we shall have to retrace our steps, leave the green beacon and head back inland back along the west pier. Which of these two, very similar pictures do you prefer, by the way? With or without people? I generally prefer my landscapes and architecture unsullied by distracting, untidy mortals. Still I feel a bit guilty now, about pushing them both in the sea. On reflection, perhaps that was unnecessary. 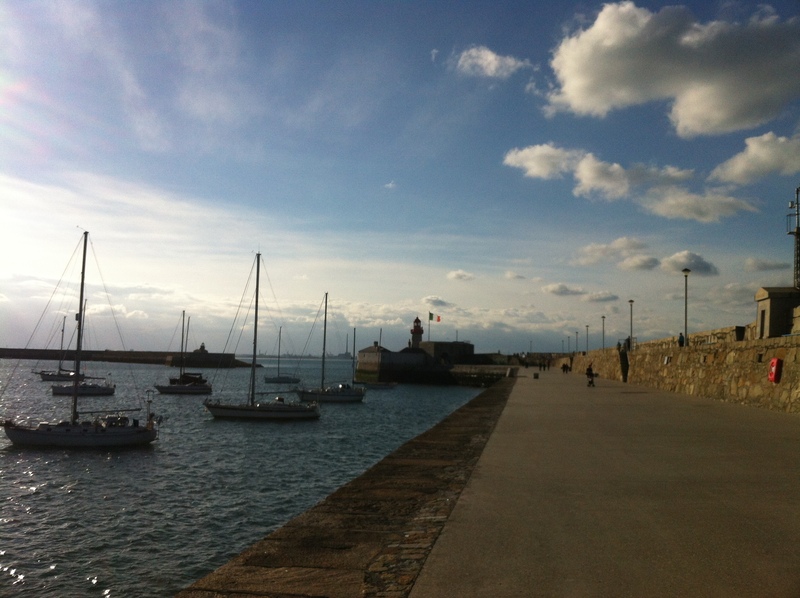 Anyway, we are now back in the seaward end of Dun Laoghaire town centre. Although Dun L as a whole is a fine and handsome town, made up of fine Victorian era terraces of large stuccoed houses, a few elegant squares and little side streets of smaller redbrick terraces, the commercial heart of the town is a more mixed bag. In this picture below you see the bell tower of the town hall, and can distantly make out, on the left side, the hideous 1970s Shopping centre (the Mall for our North maerican readers) Pretty ghastly, eh? The church opposite the shopping, St Michael’s, burned down and had to be rebuilt, although the Victorian spire survived and you can (just) see that spire, although not the modern church, the spire distantly beyond the town hall. 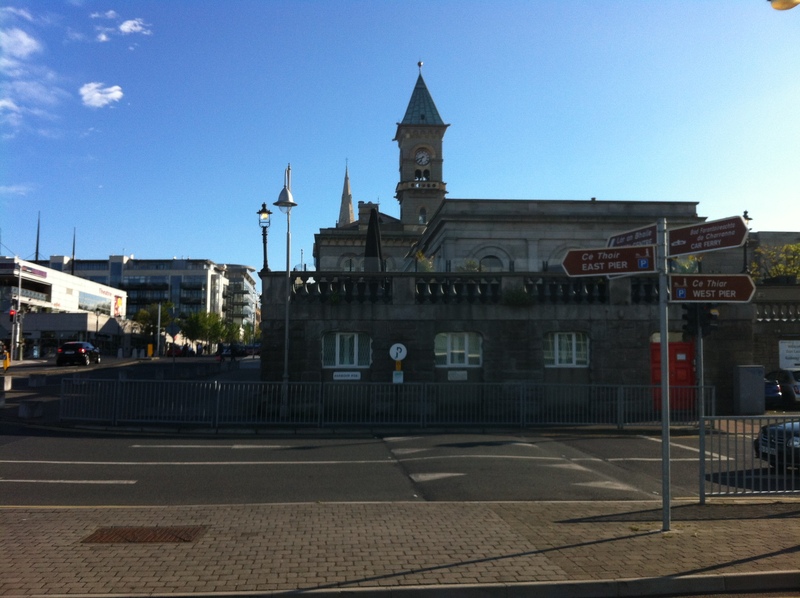 There are several churches in Dun Laoghaire, of various demoninations, and two have really big spires, that dominate the view over the town: this one and the spire of the Mariners church, now Dun Laoire’s wonderful Maritime museum, of which more in future posts. 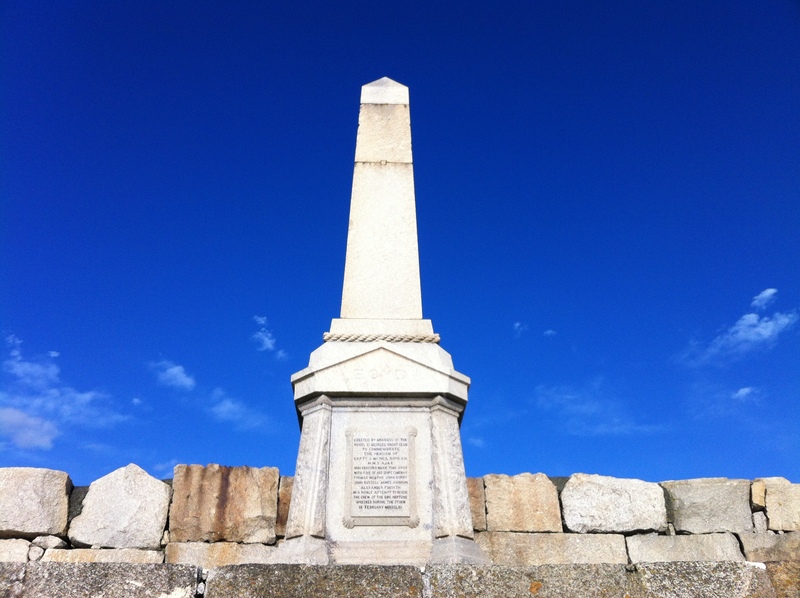 Let us make haste now to the East pier, passing through this Victoria monument, named obviously for the sovereign of that name when she visited here. 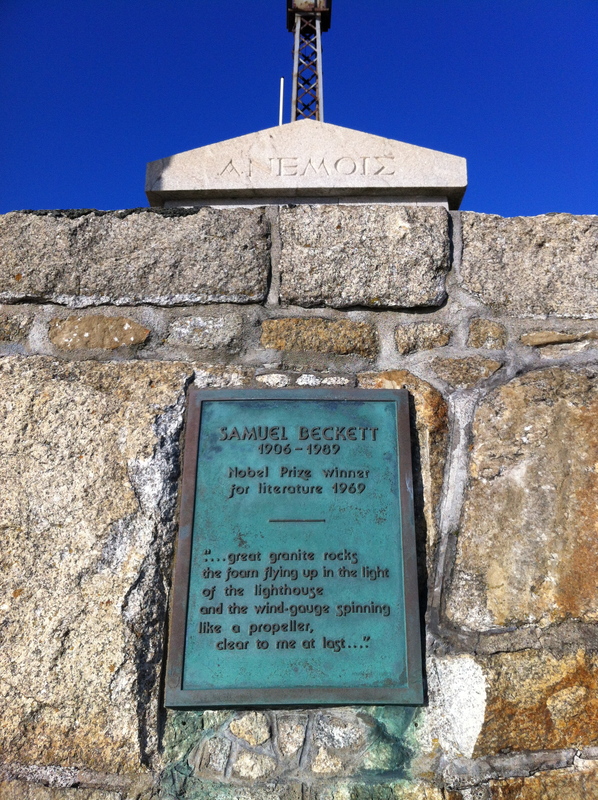 I was going here to go on one of my discursive, occasionally rambling, digressions, and do a sort of Decoding of this monument, and its somewhat kitschy, yet charming iconography. But no. I shall exercise some restraint for once. We can return to this place another day if you wish. 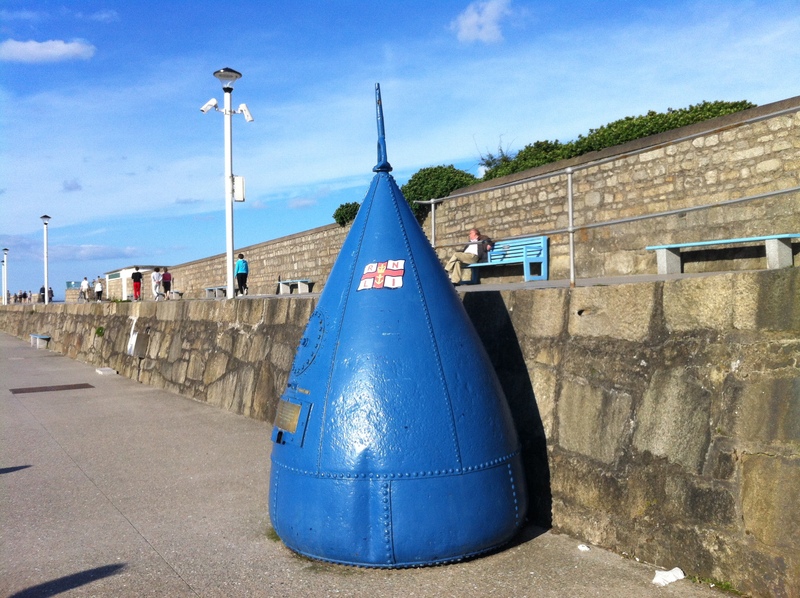 (Do you know the IRA blew this monument up?) 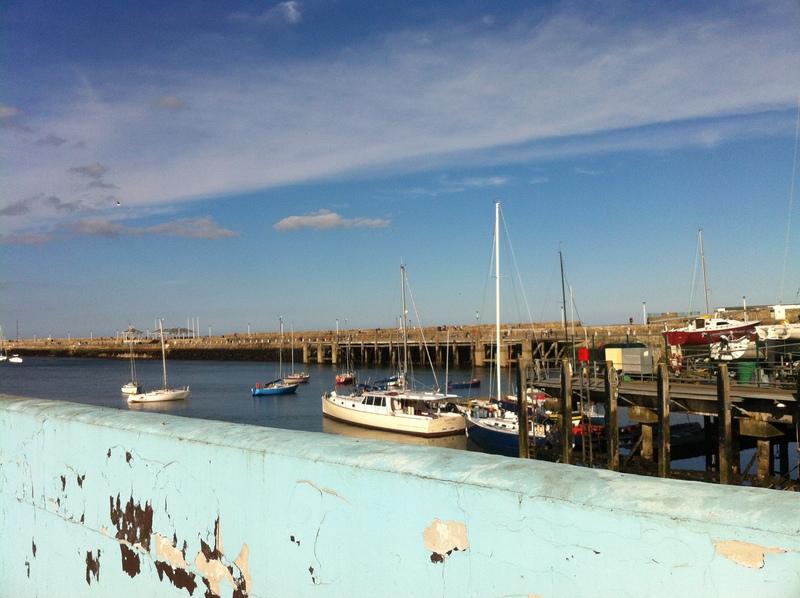 But anyway, Today you have been promised the East Pier. And you shall have it. 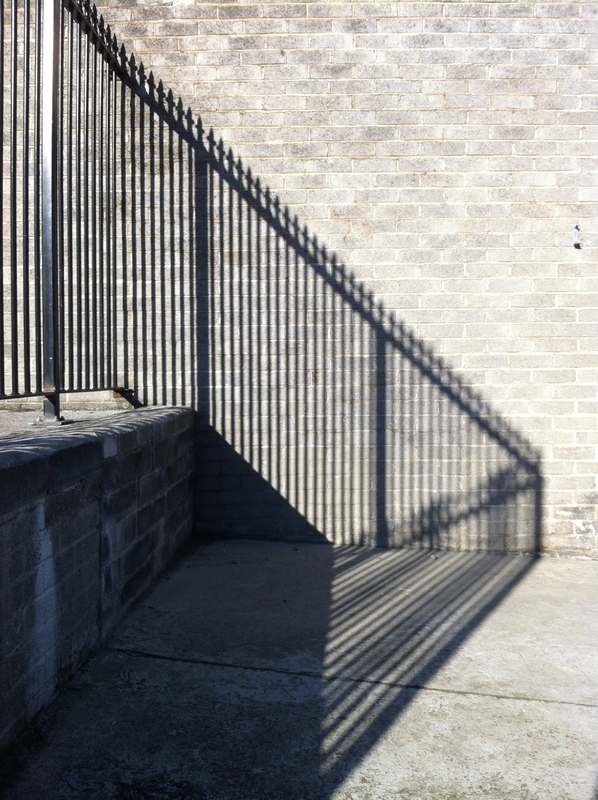 In the bright sunlight, and clear, sharp shadows, we also observe the play of light and shade of these railings projected on this wall. I especially like the way the line appears to continue at the exact same angle. Sheer good luck. Now at last we are on the East Pier itself. 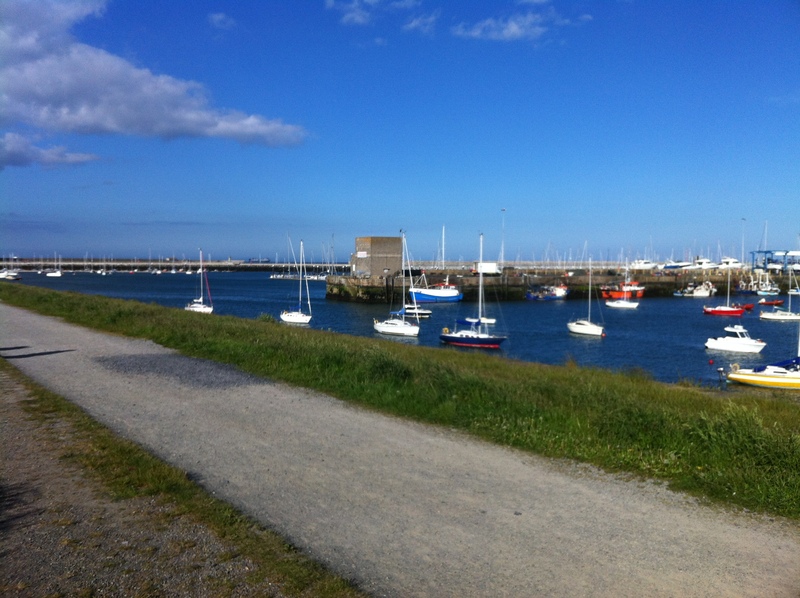 The piers were made of granite, quarried from the high hill that looks over the nearby charming town of Dalkey. The hill is more like a steep sided cliff these days, such were the requirements of the two vast piers, each a mile-long, give or take a few feet. A railway was built to transport the stone and although the rails have gone today, the route survives, It rus parallel to the modern-day, broader-gauge railway, and runs as a walking path, we locals call the path “the Metals”. 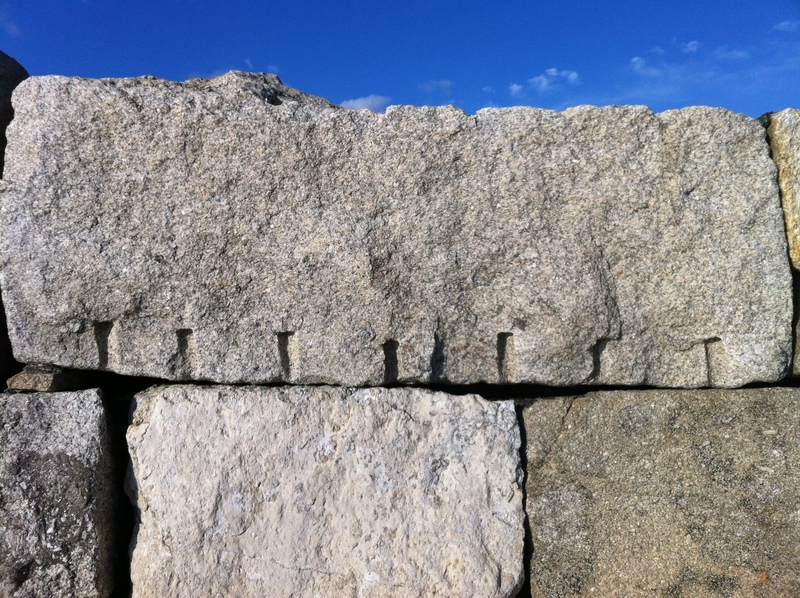 The granite of course, is what made the piers so durable, and keeps them so beautiful. 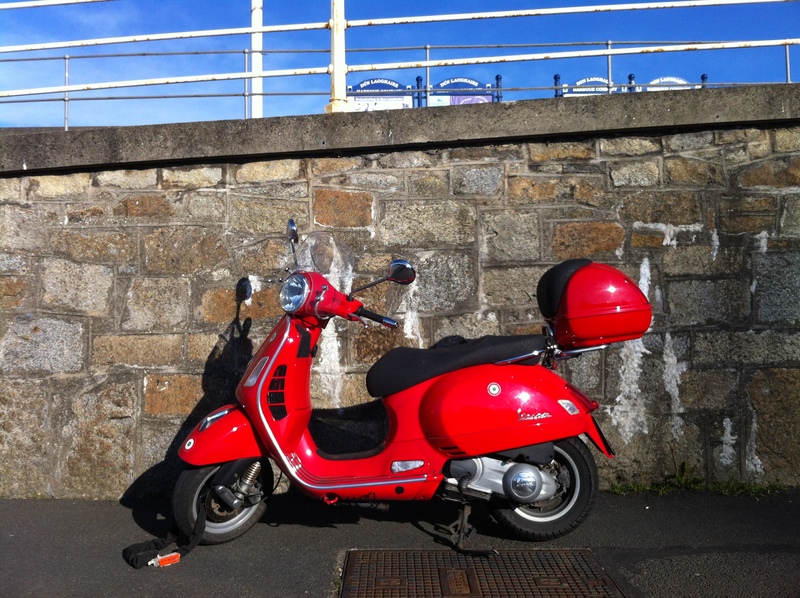 More details present themselves, everything clear and sharp in bright sunlight, this red vespa against the granite wall, this old huge, blue buoy. I think she especially likes the dark green/blue area you see running along the top left, just below the flat roof These are cast pottery, glazed ceramic tubes that run lengthways into the small building, to provide light and ventilation. Anyway, she likes them. And I like to share. What other little trophies can i serenade you with? How about this sad but beautiful memorial, to a Captain Boyd and his men? Being the astute, discerning readers you are, you’ll already have guessed they died all at once, and heroically. You would be right. I shall tell this tale another day, because I think it is worth telling properly. 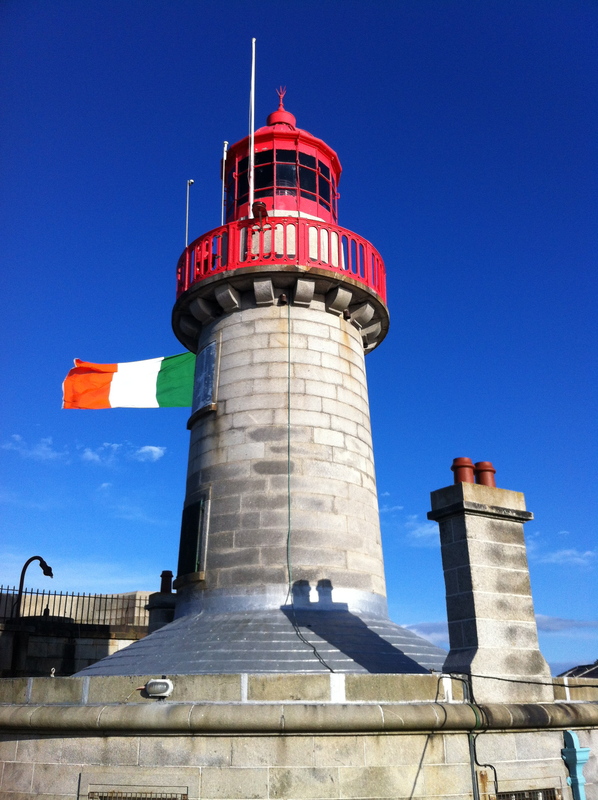 As it happens, it also connects together three of my favorite places: this East pier, the Maritime museum; and St Patrick’s cathedral in the old medieval heart of Dublin city centre. Who could ask for more than that? Besides, and finally, my mother thought someone should tell the world again about Captain Boyd, and has now more or les instructed me to relate the story. Watch this space. Let us continue our promenade, noting the boats in the harbour, bobbing up and down, in a somewhat suggestive and forthright manner. Let us ignore them, give them an icy shoulder, and note the fine lighthouse now clearly visible beyond. This of course is our destination, where else? On our way we pass this little weather station, set in a miniature tiny little Greek temple effect. 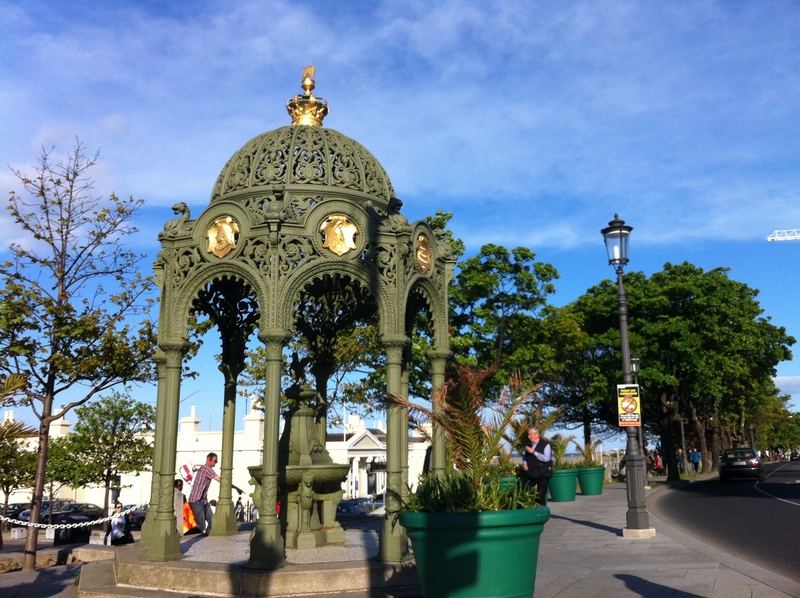 Fortunately the Victorians built things to last, otherwise Dun Laoghoire-Rathdown council quite possibly would have replaced this with something hideous, probably made of plastic. Fortunately too, the IRA republican movement have no serious ideological issue with the notion of “weather” so they, too, have declined to blow it up. 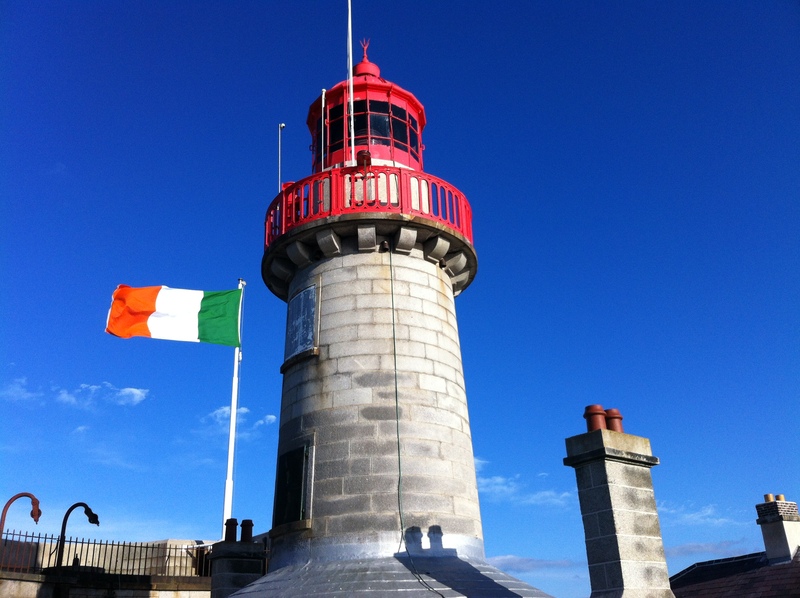 In such ways and by such mercies in Ireland, is our heritage preserved. Suddenly we are through the archway and inside the wall, thick walled complex of little service buildings that surrounds the lighthouse. 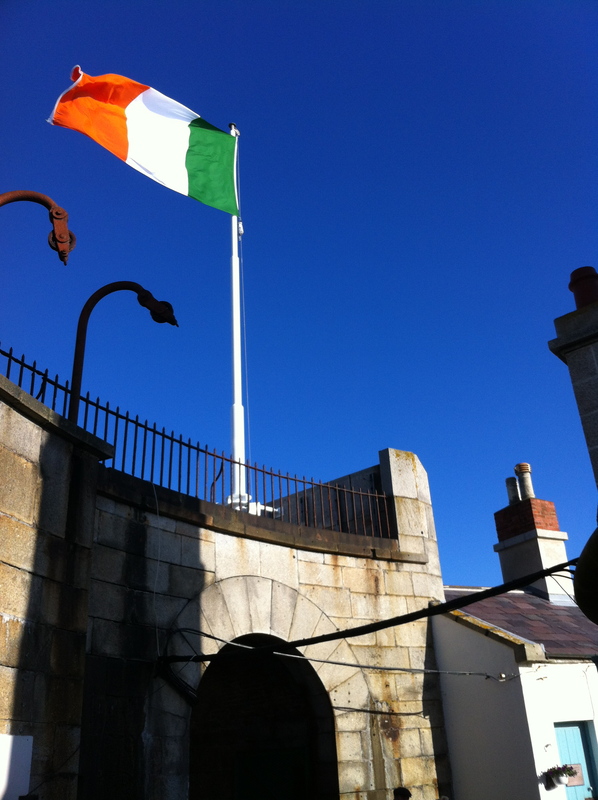 The flag snaps wildly in the wind. 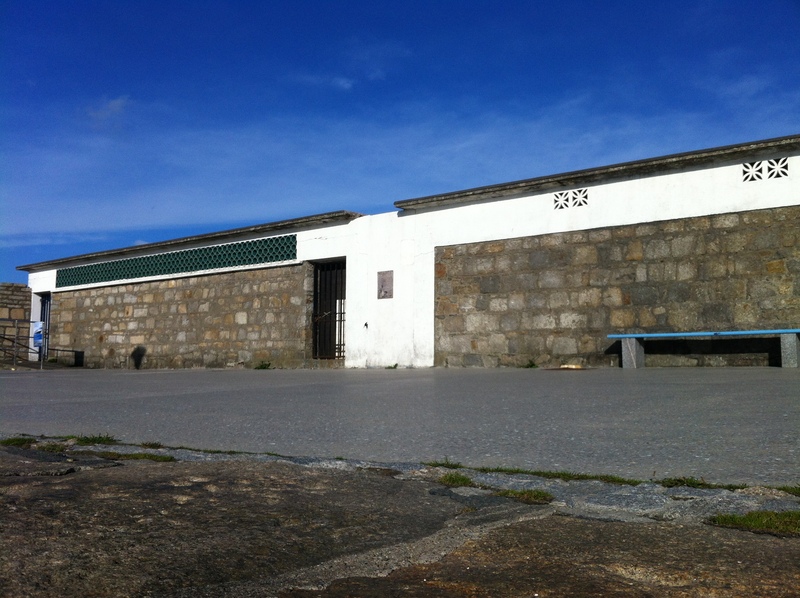 The huge 8-foot thick walls, walls, built to resist fierce waves and storm, invasion Revolutionary France, and very other possible contingency, dwarf the small lighthouse keepers cottages and other service buildings. I’ll tell you one thing that has improved. In the last few years just, in summer months, you can now buy an ice cream here. From a small van, the council has licensed. Yes, ice cream. On a hot day. on a lovely pier, with the sound and tunes of the local accordion player drifting on the sea breeze. Now that is what I call progress. On your question, the second one, which is superior for both composition and colour balance. But if you’d been quicker, you might have been able to get some arms waving frantically from the water, which might have added a note of mystery. Ha, mysterious waving arms in the water, eh? Thank you Murray, a man as evil as myself, clearly. And from an ace photographer too. (anything for a good picture, even pier tipping) Yes, also, agree, of course of the two similar pictures from the west pier return walk, you’re right, the second is superior. Many thanks Perry, and i know exactly what you mean. It reminds me of another great aphorism, also (alas) from the world of sport, from the great golfer Arnold Palmer. He hit (apparently) some outrageous drive and hole-in-one, the ball flew 400 metres or something, then rolled across the green & straight into the hole. His playing-partner muttered something about a good piece of luck. 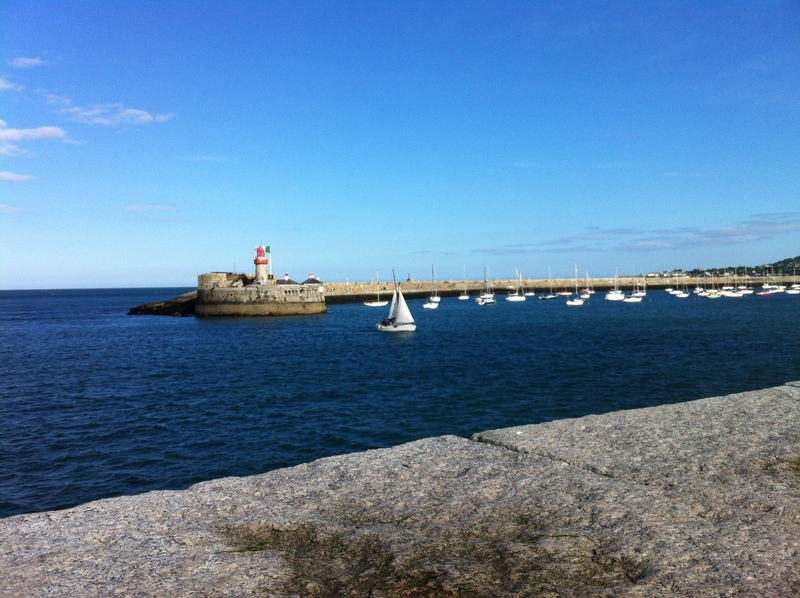 I’d say you’ll love living in Dalkey for July. 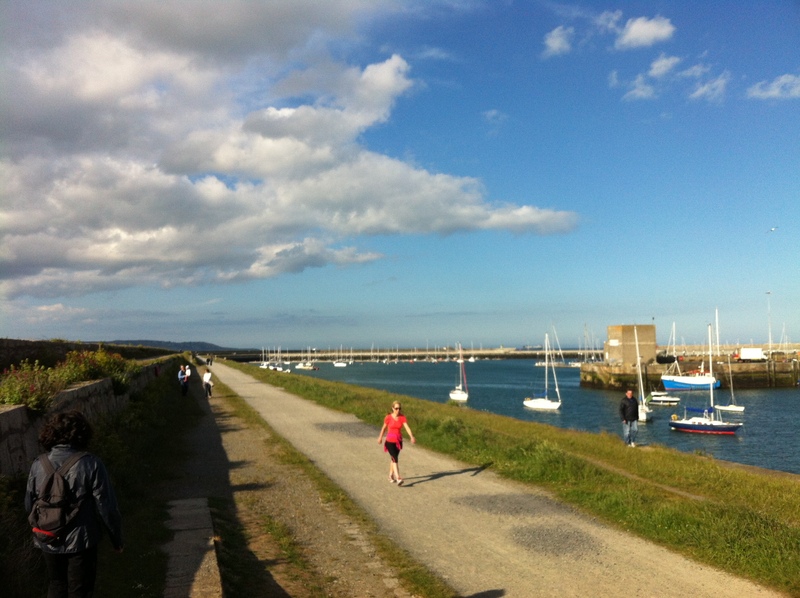 Long walks around the area, coastal and over the various hills, and quarry. 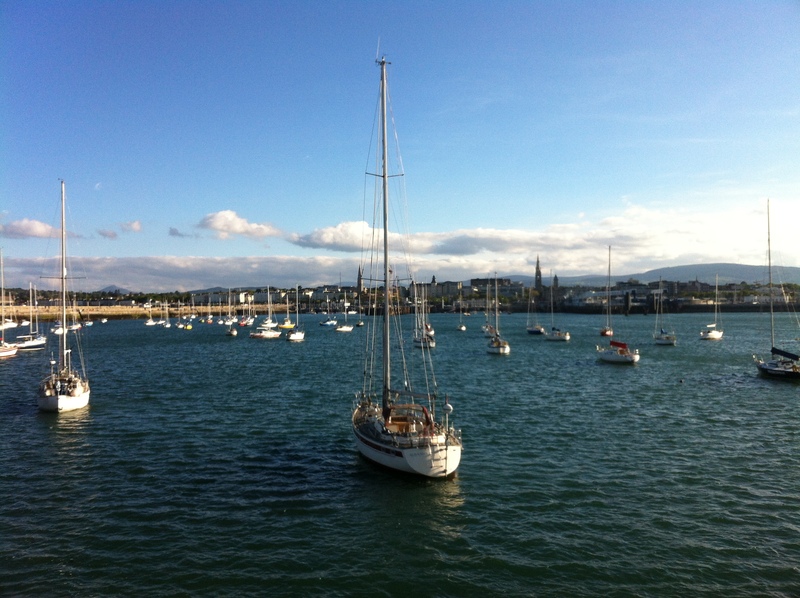 Followed by a cool couple of pints in the evening sun, on the terrace outside Finnegan’s Bar. Hard to beat really. Cant wait to hear about Capt. Boyd and also the Victorian monument. Love the photos, can feel the breeze. Your wish is my command. Unforeseen contingencies aside, they are planned as my next 2 posts, all being well. Many thanks for the kind words Val. Nice one. You have set yourself up for many more posts and stories. Await them eagerly. I was hoping you’d be telling us about Captain Boyd in THIS post. Now I’m disappointed and sad. I like that little Greek temple complete with the Greek lettering. Shame about those people from the photos, but someone has to suffer for your art, better them than you. 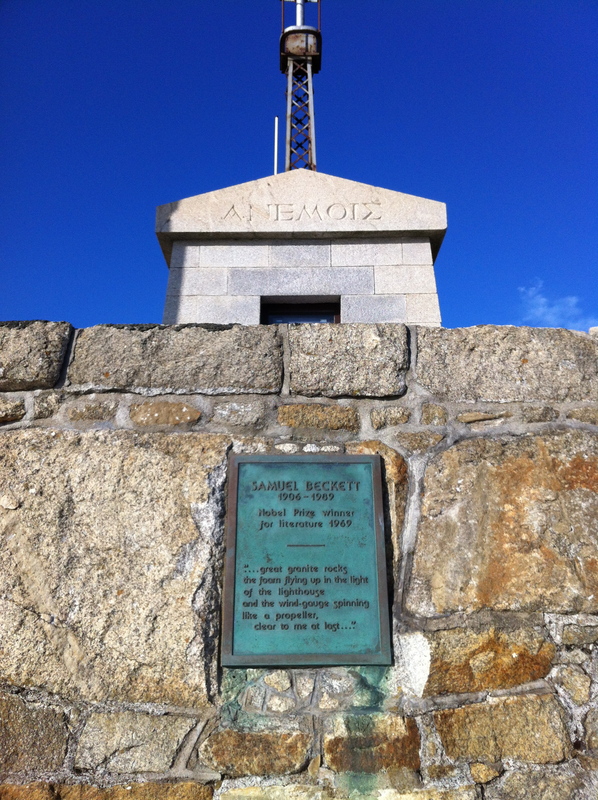 Next Post Dun Laoghaire Detail, revisited.